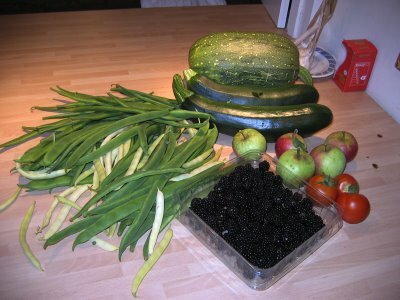 We seem to be having a very healthy season of produce at the moment. I even found this quite chunky marrow hiding in a bit mound of soil which we planted in and kinda forgot about! Not sure what to do with it yet - we're just a bit gobsmacked that it's grown so secretly as we never noticed it before. Runner beans are fabulous, we eat them practically every night! We even have a couple of tomatoes but they're not in full swing just yet - still small and green. The courgettes are a bit big but still very delicious - I've had a few roasted with seasoning and they're superb. At this rate I may not visit a grocers for a few months! 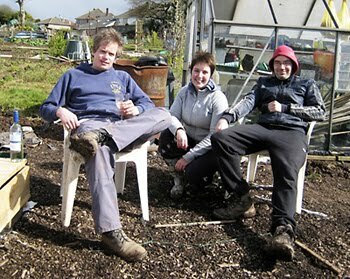 We are 3 allotment gardeners from Yorkshire (Dave), Ireland (Karl) & Cheshire (Nicole) on a Welsh plot (Cardiff). The allotment started as a plot in Pontcanna where Dave and Karl began vegetable gardening. The plot was eventually moved to Roath and whilst Dave moved to Bristol, I came to the scene at the beginning of 2006 to dig the daunting looking plot with Karl. Dave came back in 2007 and all 3 of us now tend to the land. This is our blog since 2006.